December 2017 is a key milestone for the achievement of accessibility compliance targets across public transport conveyances, premises and infrastructure. In 2002, the Disability Standards for Accessible Public Transport (Transport Standards) was released providing a staged 30-year timeframe for operators and providers to bring their conveyances, premises and infrastructure into line with the Standards. The intent of the Transport Standards is to provide more clarity around obligations under the Disability Discrimination Act 1992 (DDA), as they relate to the provision of public transport without discrimination against people with disability. The purpose of Transport Standards is to make public transport accessible for people with a disability recognising this as vital for people with disability, their families and carers to fully participate in community life, enjoy equal access to sports, education, employment, and goods and services without being limited by transport. The Transport Standards prescribe minimum requirements to be met by transport operators and providers, and includes performance requirements and timeframes for compliance set for 2007, 2012, 2017, 2022 and 2032. By December 2022, Operators and Providers are required to ensure all public transport services premises and infrastructure and conveyances (except trains and trams) fully comply with the relevant Standards. All public transport premises, infrastructure and conveyances are required to fully comply with the relevant Standards by 2032. Architecture & Access provides access consulting, design and project management services to assist providers and operators of public transport services and facilities who have responsibilities to plan, develop and design public transport in line with the Transport Standards. Infrastructure is any structure or facility that is used by passengers in conjunction with traveling on a public transport service, ie platforms and shelters. Disability Standards for Accessible Public Transport 2002 — Requirements to meet 31 December 2017 target for compliance. Requirement: Compliance with the relevant Standards by 90% of each type of service in relation to items listed below. Requirement: Compliance with the relevant Standards by 90% of bus stops in relation to items listed below. Disability Standards for Accessible Public Transport 2002 — Target for compliance. 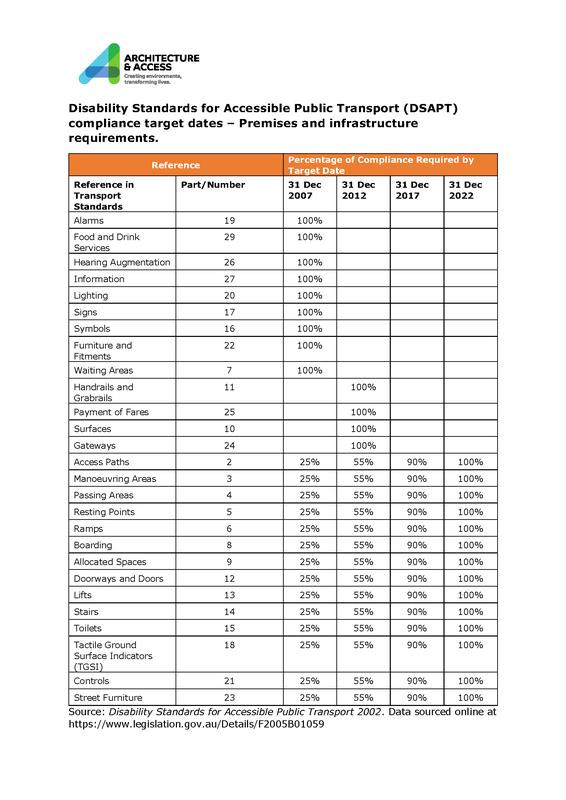 The table below shows the Target for compliance for conveyances, infrastructure and premises to meet the requirements of Disability Standards for Accessible Public Transport 2002. Architecture & Access assists providers and operators of public transport conveyances, services and facilities to meet their obligations under the Transport Standards and the Disability Discrimination Act. Please contact us to discuss your project on 1300 715 866. See project gallery for public transport projects. 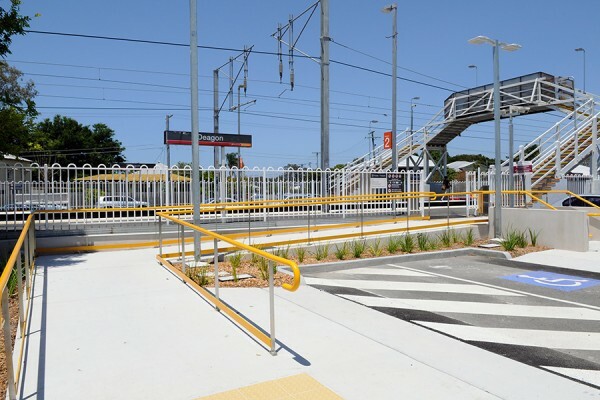 Architecture & Access assists QueenslandRail to meet Accessible Public Transport target. Read story.